NETWORK UPDATE: The NCAA CHAMPIONSHIP GAME adjusted up to a tremendous 9.1, up 1.9 over last year’s championship game even without the potential for a winner with a perfect record. Once the time zones were cleaned out, the night’s MIKE & MOLLY rerun was reduced to 1.0. There were no other changes to this morning’s numbers, including for THE NIGHT SHIFT, which held onto its preliminary rating despite its 10:01PM start time. USA Network announced today that it will be building its WWE franchise by, among other things, taking on the Thursday show that’s currently aired by sister network Syfy. The timing was apt, since the network’s Monday wrestling franchise took honors for the night on cable with 1.50 for its 8PM hour, although that was down 0.46 from last week’s 8PM hour, and the telecast as a whole was down heavily from last week, reducing to 1.14 in its last hour compared to 1.79 last week, probably because of the NCAA competition. VH1’s LOVE & HIP HOP, however, was up 0.18 from last week to 1.36, and BLACK INK CREW was steady at 0.99. The season finale of AMC’s BETTER CALL SAUL rose 0.06 to 1.19. 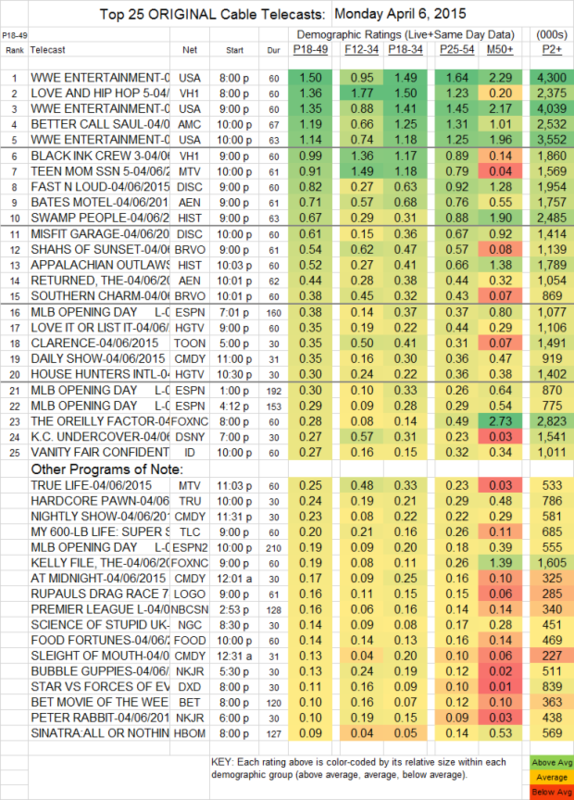 MTV’s TEEN MOM gained 0.06 to 0.91, and TRUE LIFE lost 0.04 to 0.25. On Discovery, FAST N LOUD lost a tenth to 0.82, and MISFIT GARAGE was likewise down to 0.61. BATES MOTEL (A&E) dipped 0.02 to 0.71, and THE RETURNED stayed at 0.44. On History, SWAMP PEOPLE rose 0.04 to 0.67, while APPALACHIAN OUTLAWS lost 0.05 to 0.52. Bravo’s SHAHS OF SUNSET held at 0.54, and SOUTHERN CHARM was down 0.05 to 0.38. Various MAJOR LEAGUE BASEBALL OPENING DAY games on ESPN were at 0.38-0.29 through the course of the day and evening, with 0.19 for a game on ESPN2. RUPAUL’S DRAG RACE (Logo) dropped 0.07 to 0.16. The second half of HBO’s SINATRA: ALL OR NOTHING AT ALL didn’t hold well, down by more than half from Sunday’s first installment to 0.09. PS: A FRIENDLY NOTE to the reader who’s been posting lengthy excerpts from our cable posts in the Comments section of another website–we’re glad you think our information is useful for the readers there, but that site is are much bigger than we are, and we could use the page-views, so we’d appreciate it if you’d at least credit us as the source of the material.